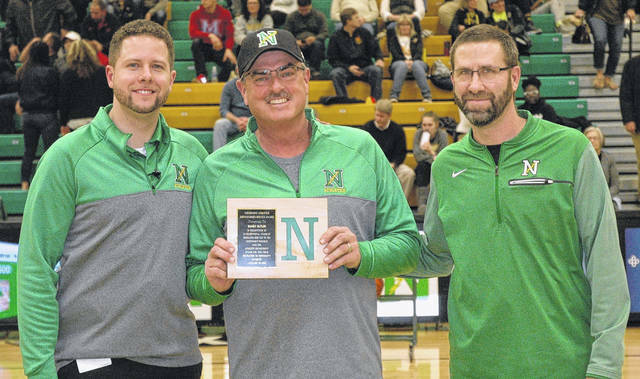 Randy Butler (center) was presented with a plaque for his 25 years of dedicated service as the head groundskeeper at Northmont prior to the boys varsity basketball game Friday. He is flanked by Athletics Director Micah Harding (left) and Assistant Athletics Director Jim Smith. CLAYTON — After 25 years serving as the head groundskeeper for the Northmont Athletics Department, Randy Butler, announced his retirement effective at the end of the winter sports season. Butler helped transform Northmont’s athletic fields from mostly dirt to some of, if not the very best, in the greater Dayton area. “Northmont prides itself in having high quality and safe facilities for our athletes and community, and that is due in large part to the hard work and dedication of Mr. Butler,” said Northmont Athletics Director Micah Harding. Butler operates RB Services, a property maintenance company that offers lawn care and landscaping services as well as snowplowing. Butler will continue to operate his business after his retirement from Northmont. Butler added that it was hard to believe he had worked for Northmont for 25 years because the time seemed to fly by. His kids attended Northmont City Schools and he said he enjoyed his time working for the district. Butler lives in Englewood with his wife, Sherri. They have been married 33 years and have three daughters: Laura 32, Jessica 30, and Katlyn 22 and have two grandchildren.